NewVoiceMedia, a leading global provider of cloud technology which helps businesses sell more, serve better and grow faster, has strengthened its executive team with the appointment of Scott Sampson as Chief Revenue Officer. Based in San Francisco, Scott will have global responsibility for NewVoiceMedia’s sales and marketing functions. 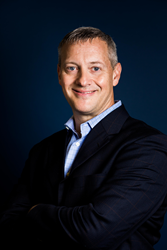 He brings over 25 years’ industry experience to the business, joining from IBM Corporation where he was previously Worldwide VP of Sales for the IBM Analytics Platform, leading a globally-distributed team of several thousand customer-facing sellers responsible for billions of dollars of on-premise and cloud revenue. Scott’s appointment is the latest milestone in NewVoiceMedia’s global expansion plans. Recently recognised as one of the world’s top cloud computing companies by Penton’s Talkin’ Cloud 100 report, the company now serves more than 500 customers spanning 128 countries. Its intelligent communications platform is revolutionising the way they connect with their customers worldwide, enabling them to deliver a personalised and unique customer service experience and drive a more effective sales team. In his new role, Scott will report to CEO Jonathan Gale, who commented, “I’m pleased to welcome Scott to NewVoiceMedia. His combination of skills and experience make him the ideal candidate to enhance our efforts across some of the organisation’s key functions, on a global scale. He will be an extremely valuable asset to the leadership team as we continue to develop our intelligent communications platform and accelerate our rapid international growth”. Scott added, “NewVoiceMedia has an outstanding reputation for innovation and is truly revolutionising how businesses connect with their customers and prospects on a global scale. With its robust technology, experienced leadership team and incredible market opportunity, NewVoiceMedia is uniquely positioned for continued rapid growth and I’m very excited to be part of the company’s future success”. NewVoiceMedia powers customer connections that transform businesses globally. The leading vendor's award-winning cloud customer contact platform revolutionises the way organisations connect with their customers worldwide, enabling them to deliver a personalised and unique customer service experience and drive a more effective sales and marketing team. With a true cloud environment and proven 99.999% platform availability, NewVoiceMedia ensures complete flexibility, scalability and reliability. Spanning 128 countries and six continents, NewVoiceMedia's 500+ customers include PhotoBox, MobileIron, TNT, Lumesse, JustGiving, Canadian Cancer Society and Wowcher. For more information visit http://www.newvoicemedia.com or follow NewVoiceMedia on Twitter @NewVoiceMedia.